This post is by Paige Myers, Textile Conservator at the North Carolina Museum of History and instructor for C2C’s “Textiles Intensive” workshop. This hepa vac costs $83.59 at Target. Vacuuming is the easiest method of cleaning a textile and often the only safe treatment possible for museum collections. Visually, it will improve the look of the textile, but more importantly, it will remove particulate (dirt, dust, insect casings, etc.) that could be damaging to the fibers over a long period of time. Select a HEPA (high efficiency particulate air) filter vacuum. These are now widely available and fairly inexpensive. To vacuum clean, a couple of methods may be used. The first method is to use a piece of fiberglass screening (not the aluminum or metal kind), cut to a manageable size. A 6 inch by 6 inch square should be sufficient. It can be made bigger if large objects such as coverlets or quilts are to be vacuumed. To protect the textile from the rough edges of the screening, cover them with blue painter’s tape, or for a more permanent solution, sew on wide bias tape around the edges. 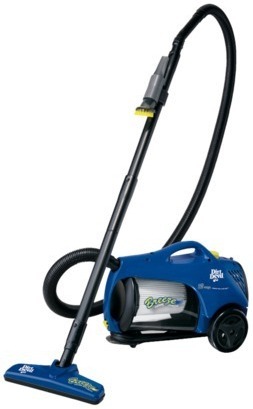 It is best to use a canister type vacuum since most modern upright vacuums are extremely powerful. Use a low setting on the vacuum, if possible, and open the vents on the handle to reduce the suction. It is important that, whatever method is used, the textile should not get sucked up into the nozzle. Start by placing the screen in one corner. It is easiest to work downward in rows. Gently vacuum over the screen in a straight line and move it along as you go. Make sure you have vacuumed all sections before turning over the textile to vacuum the other side. The second method uses tulle or netting (like a wedding veil) or cheesecloth instead of screening. It can be easily obtained from fabric or craft stores. Only a small amount is needed. For this method, fold the netting for two layers together (this reduces the chance of loose threads or beads being sucked up into the vacuum) and put over the end of the nozzle; secure with a rubber band. As with the screen method, work downward in straight rows with gentle vacuuming. A helpful hint is to keep the hand you are not vacuuming with between the nozzle and textile. I use the nozzle between the thumb and first finger. It keeps the nozzle a natural 3/4- inch distance away from the artifact. 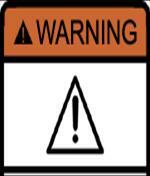 Be careful to vacuum around objects containing beads or small parts. Don’t let them get sucked into the vacuum. They could be easily pulled from the textile by weak threads. It is also possible to use a small vacuum made to dust computer keyboards. They produce less suction and are safer on more fragile textiles. When in doubt however, consult a textile conservator for advice. It is better to do nothing than to risk damaging an irreplaceable heirloom. Conservators have come up with various lists of 9 or 10 “Agents of Deterioration.” In our C2C collections care and disaster preparedness workshops, we separate these agents out in different ways. Fire and water are 2 of these designated “agents of deterioration” that result from disasters and are the focus of disaster preparedness workshops. In contrast, our collections care workshops highlight pervasive dangers of which the general public, and even museum staff members, may not be aware. In some cases there are fairly simple steps and/ or products to help protect collections from these dangers. Our job is to help you learn about what you can do to improve preservation conditions. We identify 6 factors to worry about on a regular basis. As a mnemonic device, 3 are environmental and 3 are Ps. Earlier posts have discussed several of these factors, especially light, RH, and pests but we need to say more about the most destructive and pervasive threat to our collections—people. We ourselves, our staff, and our visitors—well intentioned and well behaved as most are—present a persistent danger to our collections. This people category includes handling errors such as dropping, scraping, and touching materials like metals (especially vulnerable to hand-oil damage) without gloves. Sometimes without proper knowledge, vigilance, and caution, even good housekeeping practices like vacuuming can lead to damage. Many pieces of furniture in historic houses, for instance, have been marred by cleaners and cleaning equipment. "Wait! Come back to sign our guest book so we can count you in our visitation stats!" Unfortunately, the “People” category also includes deliberate human damage such as vandalism and theft. Remember, those most likely to steal from the collection are the researchers, staff, and volunteers who often feel deep connections to the pieces and have ready access. 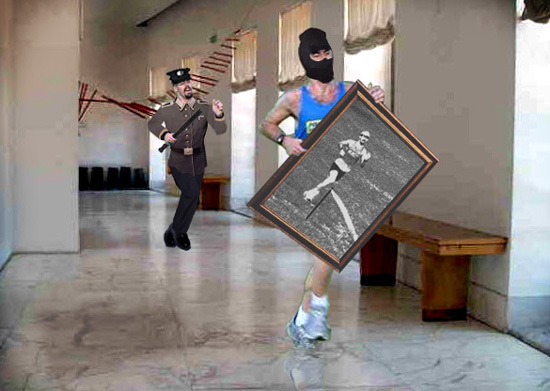 In his book, Priceless, Founder of the FBI Art Crime Team, Robert Wittman asserts that 90% of museum thefts are inside jobs. Another human danger to preservation is what the Canadian Conservation Institute terms “dissociation.” A lack of thoroughness in tracking artifacts leads to this problem. A piece of an artifact can be stored separately without a record of its connection to the whole. At other times the artifact cannot be found or its accession number is no longer legible. If it cannot be matched with its provenance, much of its value to the museum disappears. Access is always important for collections held in the public trust. Collections managers, however, must work to protect artifacts from the dangers that people pose. This post is by Kyle Elizabeth Bryner, Registrar and Collections Manager, and Sara Cromwell, PR, Marketing and Membership Coordinator. Bryner and Cromwell originally presented this information at the North Carolina Museums Council Annual Meeting, March 2012. 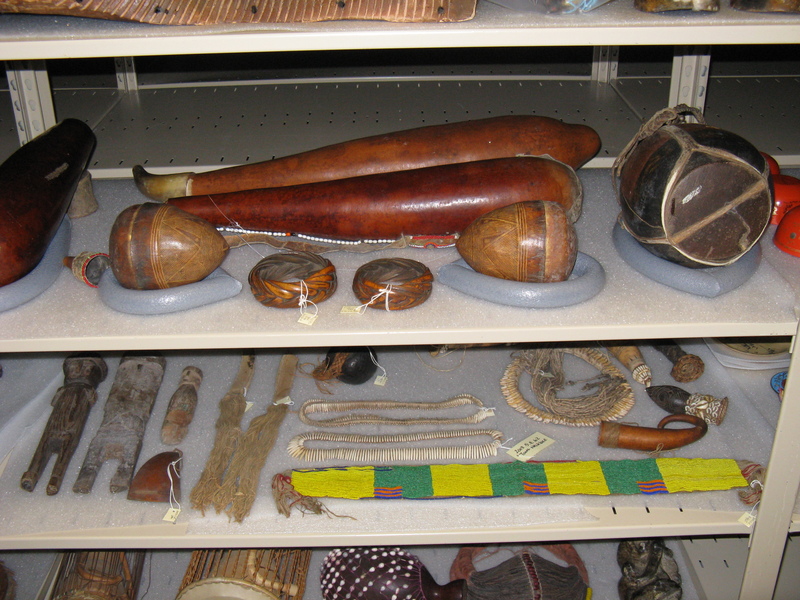 View of collections in the WFU Museum of Anthropology's new storage space--storage supplies were the result of a 2010 fundraising campaign. First, determine what collections the museum holds. A full object inventory is a priority – if you do not know what you have you cannot plan for your needs! Obtain conservation assessments, create long range conservation plans – work closely with trusted conservators. Create a list of objects in need of conservation and prioritize by severity of damage, interpretive importance and ease of conservation. At the MOA, we choose objects based on the previous criteria but also on a rotating schedule. Objects are conserved based on world region, culture and availability of funds. Accidents happen and sometimes an object is moved to the top of the list for immediate repair. Ask fellow professionals for recommended conservators or use the American Institute for Conservation (AIC) resource center to find a recognized professional. Obtain estimates. Laugh at estimates. Choose the bid that is right for your museum. Brainstorm ways to obtain funding. Work with other members of your museum staff to identify funding sources. Step outside of your comfort zone – ask everyone for ideas! Cooperation on this type of project helps you to educate others about what you do and also to understand their positions in the museum. Collaboration allows museum departments to share resources and build goodwill. Identify past and present financial donors to the museum. Identify object donors who may contribute to object conservation. Ask for recommendations for potential monetary donors from board members. Collaborate among departments to create the “ASK.” Clearly define what funds are needed, why they are needed and how a donor’s support will make a difference. Offer incentives for financially generous contributions. Plan events and interpretive opportunities to educate donors about the conservation projects. The MOA’s development and collections departments created a letter campaign to attract donors to conservation projects. MOA’s Advisory Board was involved in developing the letters and the Board President signs the letters each year. Initiated in 2008, with the conservation of a Native American hide robe, the “Save Our Hide” project raised over $1300. At the time, this was the most raised to date for conservation. We send letters in November to encourage year-end giving and structure the donation form to encourage higher levels of giving. The average gift amount has shown an upward trend. Due to the restrictions of being a university museum, MOA accepts cash or check, and recently moved into the 20th century by accepting credit cards by phone. We were reluctant to depend solely on the untested letters, so we also applied for grants. The initial conservation project received additional funds from the North Carolina Preservation Consortium and the IMLS – Bank of America, American Heritage Preservation Grant program. The granting agencies applauded our resourcefulness in preemptively soliciting individual donors to the project. 2008- Painted Native American Hide. Amount raised: $1,340 in donor funds. $4,645 from grants. 2009- Yan Ka Di Puppet from Mali. Amount raised: $1,635 from donors. 2010 – Conservation and Storage Supplies Drive – Amount raised: $1,305 from donors. 2011 – Barongsai Masks from Bali. Amount raised from donors to date: $1,075. Most of North Carolina’s nearly 1,000 cultural heritage institutions rely on volunteers for daily operations. 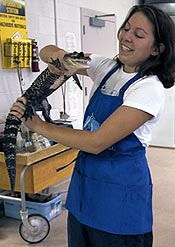 Volunteers are also crucial at larger museums such as the Museum of Natural Science, where they often lead public programs. This week (April 15-21) is National Volunteer Week and a good time to take stock of your volunteer program. Is it robust, or has it atrophied in recent years? Are you actively recruiting and screening new members for your volunteer corps? And, perhaps most importantly, do you have incentives or recognition programs in place for participation? In addition to important volunteer-recognition activities that volunteermatch.org recommends and references, your institution needs to offer specific incentives for cultural heritage lovers. Organize social opportunities for volunteers to interact with each other and learn more about the topics to which they’ve devoted themselves. Some museums schedule annual (or more frequent) volunteer field trips to a cluster of other cultural heritage institutions. This can be a great way to build community within your volunteer corps and help the group share ideas about possibilities for your own organization. Consider curation as a volunteer-recognition activity. Have a volunteer recognition case in your museum where you can display a photo and brief description of a particular volunteer, along with one or more artifacts that (s)he has selected. Print a label discussing the significance or appeal of the piece(s) for the volunteer. You can do this in a blog as well, but giving a volunteer the chance to work with you in the collection to make a selection for a quarterly case rotation, strengthens and celebrates the individual’s physical connection to your museum. Opportunities to interact with collections are strong motivations for many to donate their time. 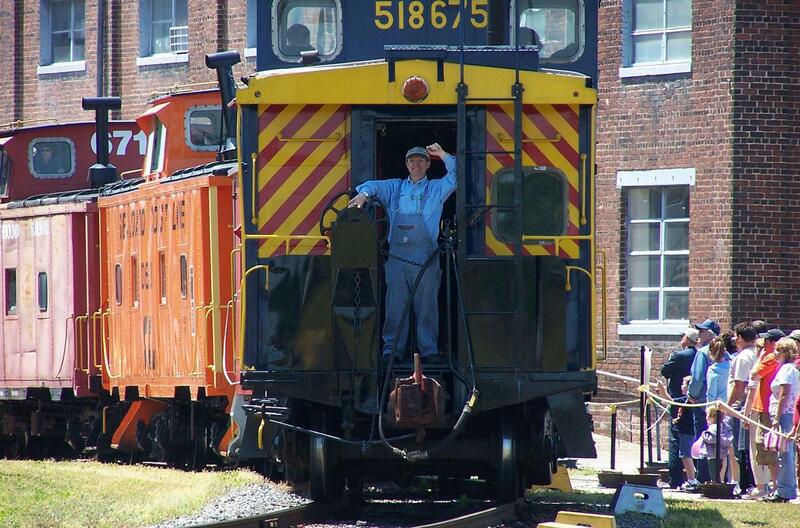 Several train museums in North Carolina have especially strong volunteer groups. George Weber, a volunteer at the NC Transportation Museum in Spencer, greets visitors from the some of the collection’s rolling stock. Unlimited train rides are among several perks NCTM volunteers receive. What volunteer incentives have worked well at your institution? Do you have any volunteer program tips to share with others in our NC cultural heritage community? 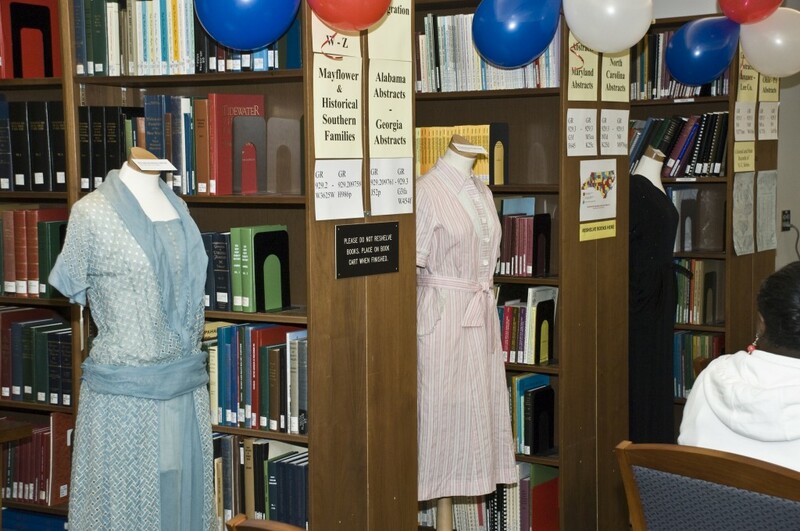 1940s-era dresses on forms from the NC Museum of History populate the spaces between the stacks in the NC State Library during its census release celebration. The National Archives released the 1940 Census online over a week ago. The day of that release, the North Carolina State Library held a special celebratory event with expert speakers, period music, cake, and an array of artifacts on display from the NC Museum of History’s collection. Although most of the promotional materials for the census release have been geared toward genealogists, the data can also be a terrific boon to site researchers. If your museum is located in an historic building or if the interpretation of a particular site is important to your institution in any way, start clicking! A wealth of new information may be at your fingertips. Name indexes have not been completed yet for most states, and that poses a problem for genealogical researchers. Those investigating a specific location, however, are in luck. Find out who lived in your historic house or other structure in 1940. You may know family members already, but were any servants living there? Do the names and ages of children match the information you already have about your site’s inhabitants? In some cases, the Depression forced extended family members to move in together or larger households to take in boarders. Does your site reflect this pattern in any way? Also, occupations changed quickly around 1940 as a result of upheavals during the Great Depression and the Second World War. Federal emergency relief agencies employed some people during the latter part of the Depression. By 1940 certain industries were gearing up to supply war needs overseas. Can you learn anything new about employment for the residents of your site? Partly to track Depression-era migrations, the 1940 Census contained a question that had not been posed in previous censuses. “Where did you live in 1935?” The answers that your site’s residents offered for that question may supply new information and/ or additional research leads. Ancestry.com is one of several online genealogical research databases posting the 1940 Census. Although access to most of the site’s material requires a subscription fee, 1940 Census data is freely available through that portal. Moreover, many public and academic libraries provide patrons free access to ancestry.com. The site also contains other resources such as city directories and draft records that can help flesh out the research leads the census records may provide. Has the 1940 Census helped you make any exciting research discoveries? Can the new stories it suggests re-invigorate your site’s interpretation? As institutional record-keeping becomes more computer-driven, collections management practices are shifting. What changes have you noticed at your own institution? Is the craft of cataloging becoming obsolete? Does the brevity that database systems encourage deter the inclusion of potentially significant details about a piece? Does your institution still use hard-copy catalog worksheets and then enter data into a database? The following cataloging guidelines are old-school, but they may still be effective prompts for data gathering. E. Measurements: clarify units of measurement and dimension type, provide height or length first, then width, then depth (ex. : H=4’3” x W=19” x D=12”). Diameter (dia.) can replace width and depth. Include weight if important for storage needs or identification. B. sketch: at times a photo may not be possible; also a sketch can emphasize and clarify certain details of the piece. IV. Documentation: include inscriptions and markings on the object itself and attachments relating to any research on the object itself, maker, or genre. 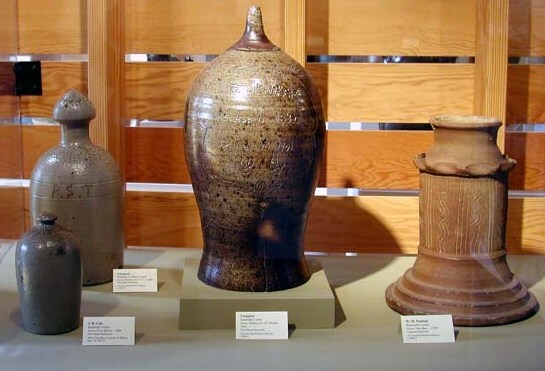 One of the most unique artifact traditions in North Carolina is that of pottery gravemarkers, found mostly in the Piedmont region. 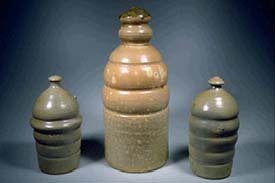 Local potters formed them out of salt glazed stoneware, and most surviving examples date to the 19th century. Unfortunately, few graves are left with these relics. The fates of some are unknown, like this example stolen more than two years ago from the Cane Creek Friends Cemetery in Snow Camp, Alamance County. In other cases, the gravemarkers are being preserved in North Carolina collections, such as the Mint Museum, The Ackland Art Museum, and the NC Museum of History. 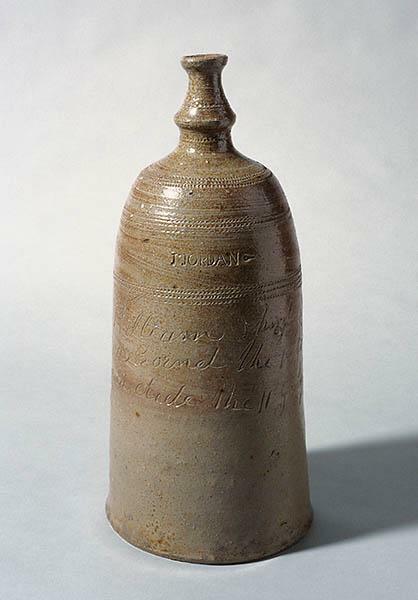 Unlike Israel Woody’s stolen gravemarker–made by potter Solomon Loy in 1834, most pottery gravestones are shaped like vessels, rather than carved stones. Randolph County potter Jesse Jordan made the gravemarker, now in the NCMOH collection, in 1877, at the death of 3-year-old William Spinks Jordan. Baskets are a craft form with deep roots in North Carolina. Because of their light sensitivity and fragility, these artifacts often require special care. 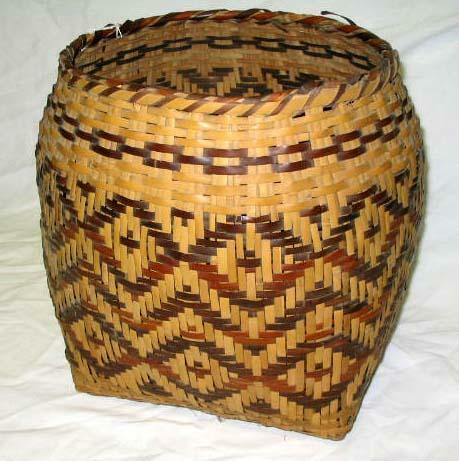 The North Carolina Department of Cultural Resources preserves a wide-ranging basket collection, representing various materials, functions, and cultural groups. 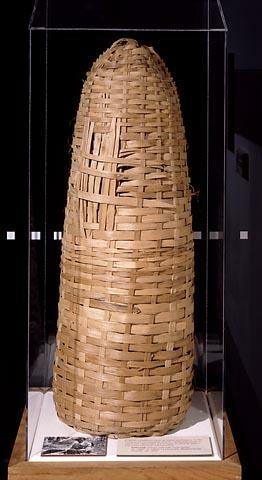 The Cherokee tribe in the western part of the state made baskets primarily of rivercane but also of white oak and honeysuckle. With a variety of patterns and dyes, these crafts comprise North Carolina’s most intricate and persistent artistic basketry tradition. Some baskets contained agricultural goods or other food products. Farmers often used split oak baskets for gathering cotton or displaying tobacco leaves. 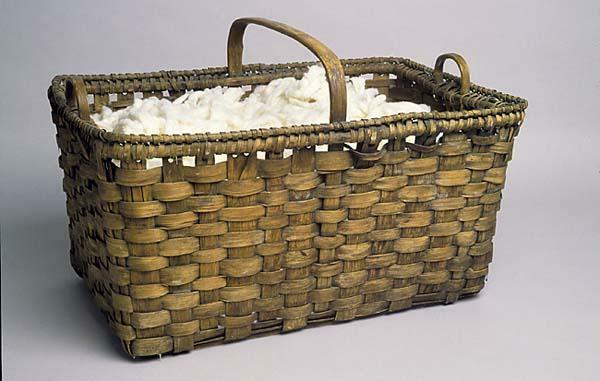 The cotton basket came from a Rowan County platation and dates to the mid-19th century. The tobacco basket was used in Dunn during the first half of the 20th century. 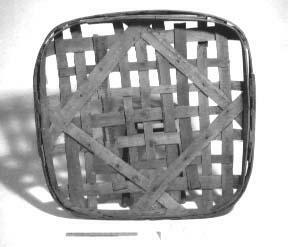 Leon Berry, an African-American who lived in Mecklenburg, made this basket fish trap in the 1970s. Other baskets served more domestic purposes. One basket in the collection was used for holding a baby; another carried dead bodies. Waste baskets and laundry baskets had more mundane functions. 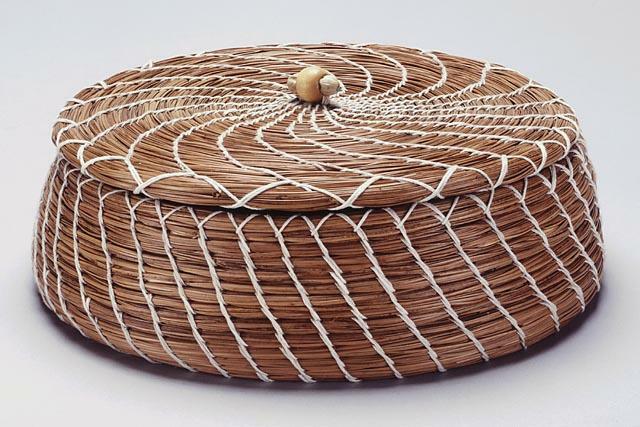 A pine needle sewing basket, made by Loretta Oxendine–a member of the Lumbee tribe, reflects the use of local materials and lowland traditions of the Southern Coastal Plain. During the twentieth century, baskets took on new industrial functions and artistic forms. From 1927 to 1995 Murfreesboro, NC was home to Riverside Manufacturing Co., “The World’s Largest Basket Factory.” Farms, canning companies, and A&P Grocery stores were primary clients. (For more information on this past industry, see pages 3-4 of a recent online issue of the Murfreesboro Historical Association’s newsletter.) A 2008 recipient of the Order of the Long Leaf Pine award, Billie Ruth Sudduth, uses basketry techniques to create fine art, including Christmas ornaments that have adorned the White House Christmas tree. What types of baskets are in your institution’s collection? Have you taken special measures to preserve them or make them accessible?